I found out that there is a hierarchy of remote islands. There are the big main islands, which are reasonably remote, like Pohnpei or Weno on Chuuk (my next stop). These islands have international air service like the Island Hopper I talked about in an earlier post. Then, there are the islands you can get to by small boat that are less than two hours from the mainland. Then, there are remote islands that are a few hours away in a small plane, like Pingelap, the island where the color blindness is so prevalent (achromatopsia). These have small airstrips. And then there's an atoll like Nukuoro, which is hundreds of miles away from a main island and has no airstrip. These islands get visited one or three times per year by a ship that circulates around the region. Nukuoro is also unusual in the FSM in that it is inhabited by people of Polynesian descent rather than Micronesians. We found out about Nukuoro because of a brochure in the Joy Hotel, where Mike Terlaje and Mary Kidd were staying in Pohnpei. By the way, Mike and Mary work for the University of Guam at the Center for Excellence in Developmental Disabilities, Education, Research and Services (CEDDERS), who manages the Pacific Consortium for Instructional Materials Accessibility Project (CIMAP), which is the whole reason I'm here in the Pacific! 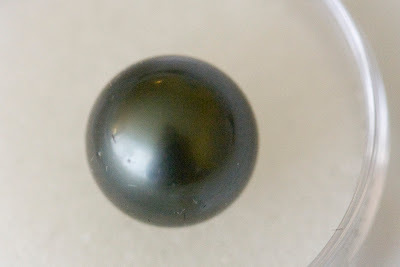 So, there was this nice brochure about black pearls. That sounded pretty cool to us, especially Mike and me (since we were away from our wives on Valentine's Day). But, there was no address of a store: just a phone number and a PO Box. We asked the nice folks at the Joy, and they said that we just should call George. Mike called George and he joined us for breakfast the next morning at my hotel, the Ocean View (really does have an ocean view with wrecked ships in the cove below it, more on that later). We found out all about Nukuoro, and how its residents had set up a community owned social enterprise to grow black pearls in their lagoon. George is from Nukuoro, and is a one-man marketing program for their product. There's an elementary school on Nukuoro, but kids have to come to Pohnpei when they are 14 to go to the high school here. 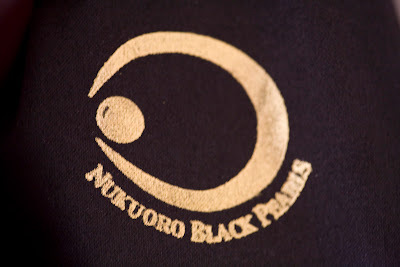 Nukuoro has a special kind of Oyster, the Black Lip Pearl Oyster, which grows these lovely pearls. They aren't actually black, but rather a lustrous dark gray (and there are many shades of this gray). George pulled out his case of pearls, each one nestled in a little round plastic box with a white foam bed. They were gorgeous, and Mike, Donna and I each decided to buy something from George. But, I wanted to know more about the social enterprise, probably much more than the average purchaser of these pearls. George described the venture as being reasonably successful, but capable of more scale. The venture was the biggest employer on the atoll, employing seven full-time (and supporting fifty people out of the three hundred who live there). But, George thought it could easily double in size. He noted that they aren't producing enough pearls to interest a major jewelry operation, but that they could. They also have to import the expert technician who knows how to insert the "seed" into the oyster, which then takes 18 months to produce a pearl. George likened it to being an expert surgeon. Chartering a boat to Nukuoro costs almost $10,000, so it would be good to have greater capacity to utilize these rare visits. We discussed finding capital, and I noted that there would be a solid option to find a socially oriented lender to lend money for an expansion plan. George felt that Nukuoro needed on the order of $100,000, but that he thought that a grant would make more sense. I actually agree with him: a social loan is a high-cost transaction for an amount that size and a grant would probably be a more sensible option. I left my meeting with George admiring his community for finding a way to make their way of life viable in today's world. And, the product is beautiful. I saw a pair of nice earrings on Mike's wife, Miriam, when I came to Guam (more on that in future posts). And, my wife and daughter may have to wait a while to find out what I'm bringing home! keep it up the good work island workers and by the way keep the beauti of our island!